REDWOOD CITY, CA (May 3, 2017) — Gender diversity on public company boards has become a hot-button issue in recent years, as investors and other governance advisors have shined a spotlight on the low representation of women in the boardroom. 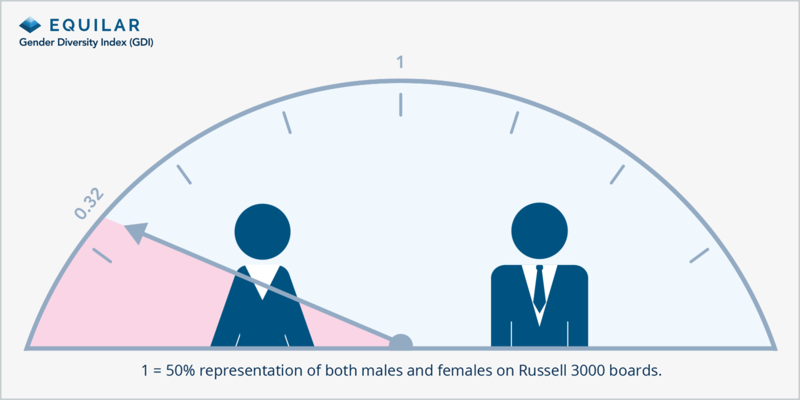 The Equilar Gender Diversity Index (GDI) was initiated in 2017 and provides quarterly updates on the prevalence of females on Russell 3000 company boards of directors. As of March 31, 2017, 15.9% of Russell 3000 board seats were occupied by women. As a result, the Equilar GDI is at 0.32, with 1.0 being equal representation of both male and female directors on public company boards. Women accounted for nearly one-quarter of new directorships. 24.3% of directors added to boards in Q1 2017 were female. Out of 614 total board seats filled in that period, 149 went to women. All-male boards are still common. 642 companies, or 22.5% of all Russell 3000 boards, had zero women. However, In Q1 alone, 24 boards that were previously all-male added a female director. A small, but growing, number of boards have eclipsed 40% representation. The number of boards the have reached parity continues to rise: 22 companies in the Russell 3000 had reached gender parity—up from 21 in 2016—while another 46 were between 40% and 50% female representation, an increase from 42 in 2016. The Equilar GDI reflects changes on corporate boards on an ongoing basis. Most indices that track information about board diversity do so annually or even less frequently, and typically with a smaller sample size, sometimes looking back more than a full year by the time the information is published. While this data is reliable and accurate, given the pace of change in corporate boardrooms, the Equilar GDI aims to capture the influence of the increasing calls for diversity from investors and other stakeholders that is influencing a rapid rate of change. The Equilar GDI is powered by Equilar BoardEdge, the largest database of board members and director candidates. BoardEdge includes exclusive features such as the connections map, which shows how board members and companies are connected to each other, as well as the Equilar Diversity Network (EDN), a “registry of registries” of board-ready executives from leading ethnic and gender diversity partnerships, organizations, and publications.